As the month of Fashion Weeks came to an end, and the whirlwind of shows finished, Schön! looked back over the collections for a review of the trends and novelties that were seen on the runways. 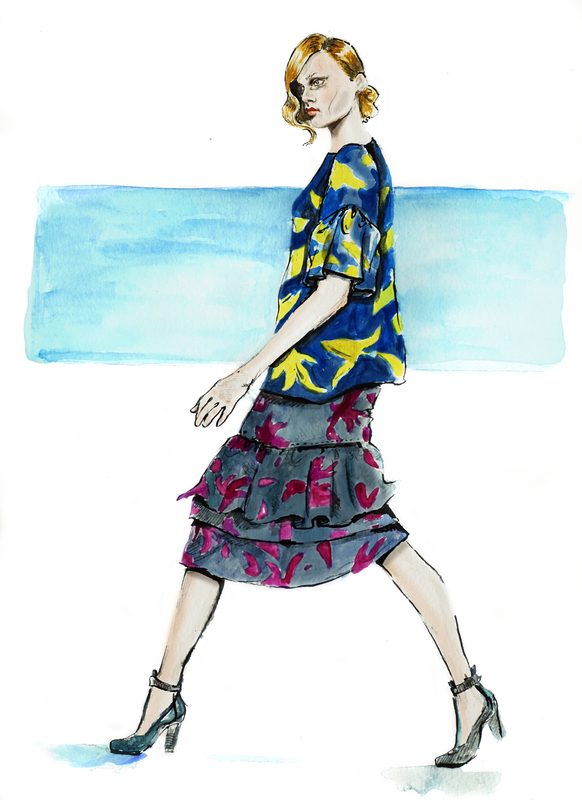 From the catwalks, our editors bring you their favourite looks, illustrated by Natalia Jheté. 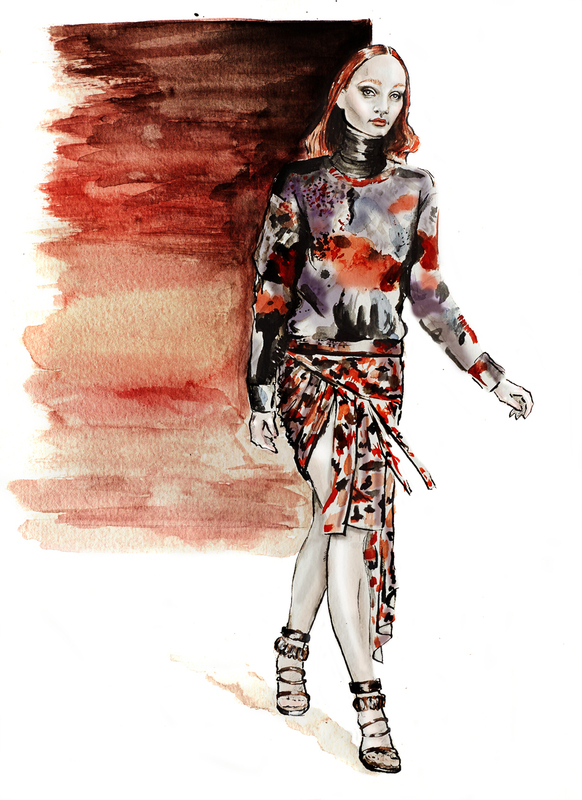 Whether it be the colourful, psychedelic prints seen at Dries Van Noten, or the wildly successful Tom Ford 61 dress, the Autumn / Winter collections have a lot in store to look forward to. There was a lot to love at Prabal Gurung this season: inspired evidently by a fortuitous trip to Nepal, the collection was a fiery pastiche of fur, fringe and robes galore, all topped with an exotic jingle, heard from sandal-stilettoed ankles adorned by tiny brass medallions. All of it was a world away from the award-season glamour we have come to expect from Prabal – and thankfully so, for those of us not on the Hollywood A-list – but what made us love this collection even more was its sheer wearability. With Prabal’s exotic pieces this season incorporating the best of American sportswear elements, the collection translates well to real life. 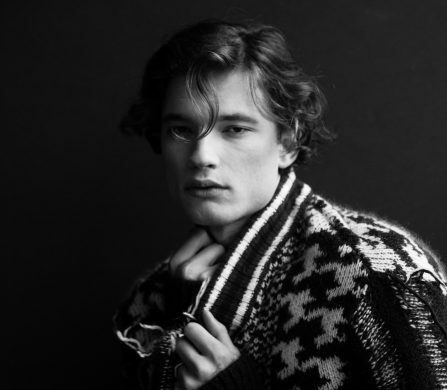 The sweater in this look sums up the fantasy of his Nepalese adventure, but can be thrown on over nearly anything – a dress, a pair of trousers, or your favourite jeans – the perfect no-fuss compliment to anyone who wants to catch a glimpse of themselves on their heavy-eyed morning commute, and pretend they are visiting someplace wholly more magnificent. 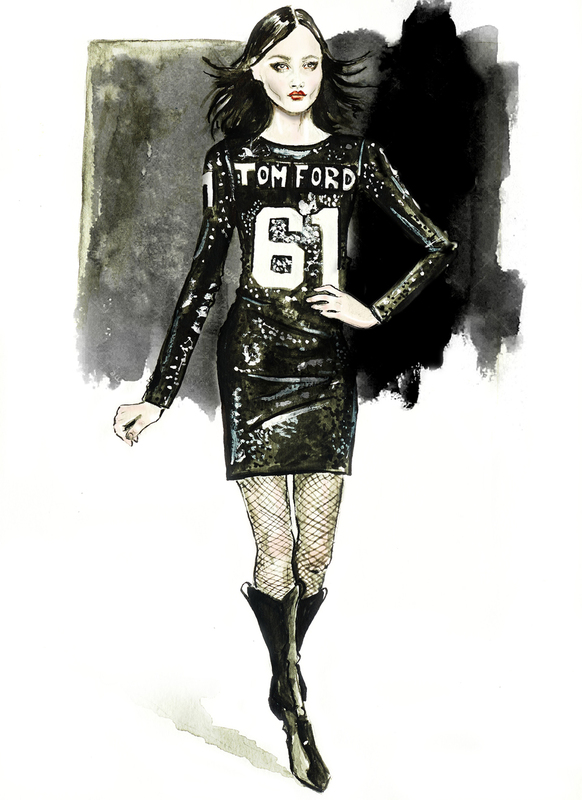 Much could be anticipated of the Tom Ford show. With the shadow of last season’s spectacular show, opulence could be expected. However, with an aesthetic which was parred-down in comparison to the S/S 2014 collection, Tom Ford proved his excellence in manipulating fabrics, shapes and cuts in a more muted extravagance. In the midst of the velvets, furs and elegantly-draped dresses, this look stood out as a favourite. Not only did the sequins glitter dramatically all the way down the runway, but Tom Ford also toyed with humour, with a reference Jay Z’s song which, coincidentally, carries the same name as the designer. The number seen on the runway had crossed out the name of a certain “Ms. Molly” referenced in the song. We cannot imagine what Jay Z meant by “popping Molly”, but what is sure is that Mr. Ford claimed Jay Z’s knockoff for himself, using his year of birth for the logo. Ironically enough, Beyoncé was seen sporting the look on her Mrs. Carter tour. Go figure how that works in terms of the re-appropriation cycle. Dries Van Noten paired kaleidoscope prints with brilliant leaf patterns, making his Autumn/Winter 2014 collection feel like an otherworldly optical illusion. 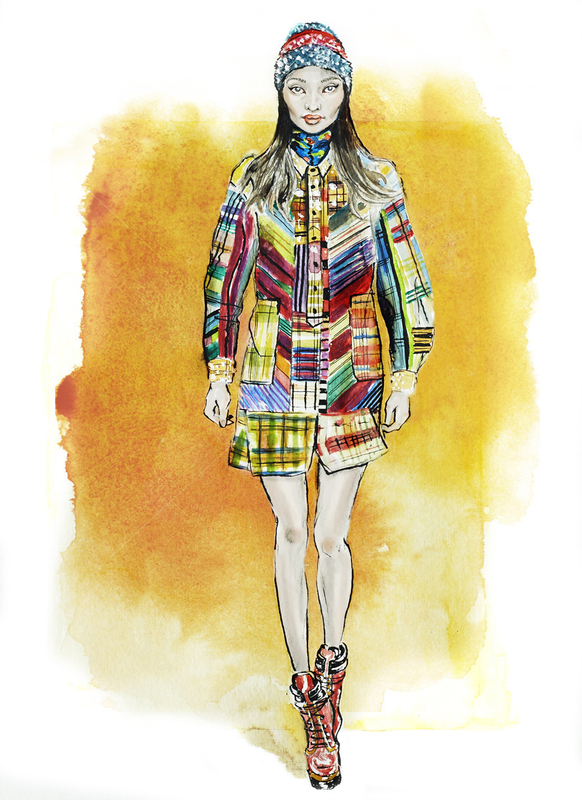 We admire the Belgian designer’s daring interpretation of the most electric vibrant colours on sleek silhouettes. This particular look stands out to us because it highlights the strongest parts of Van Noten’s design aesthetic. The boxy top with slightly puffed sleeves echoes the low ruffles on the pencil skirt. Proportions are elongated, further playing on the optical illusion theme. The contrast of yellow on navy, bubble-gum on grey, and fuchsia on ash makes this look a colourful work of art. Whether the Van Noten woman is going to a cocktail party or a rave, you’re bound to follow her. Just don’t get too lost in the psychedelic swirls.